how about just making the map editor simpler in the first place, (i assume that's hard to do but I'm just saying) because i think any random person should be able to create a map, but hey the game isn't about map making its about superfighting. Do you have any specific designs in mind that will make the editor much simpler to use? In it's core you only need to drag in tiles from the right list into the workspace and you have a map to play. Last time i checked it (which was about a year ago) i spent like 20 minutes trying to do stuff and place mess but couldn't figure it out. So it was really me just not knowing how to use it. I spent a little more time on it about an hour ago and i have much better understanding,[is there a way to test the map in the middle of making it???] Also i guess my new suggestion is, How about a tutorial fro the map editor or something like that? Also i guess my new suggestion is, How about a tutorial fro the map editor or something like that? There is also a Template map given in the folder,Its much like a tutorial map for beginners.Which show's every basic part for map making. but hey the game isn't about map making its about superfighting. Yes, for most of the people the game is about superfighting, but there is the part of community that mostly makes maps/scripts. I'd like to have more plants and wildlife here. For example rug-like grass tiles and bushes would be very nice. Time for MORE marker suggestions! I would like to see something like this come true, but I strongly fear that It won't happen since the player could create a new fixture (a box2d collider to be clear) that could be concave and this is not acceptable in the engine. Nothing impossible though, only a lot of work (and equally willpower from the devs) to add the new mechanic, some check in the editor to accept only convex shapes and prevent futher game breaking bugs due this new addition. sometimes I think that for adding these time-consuming features they should consider to hiring some extra code helpers (and no, I'm not thinking about myself, I cannot handle an entire game as developer, also because I've already a job currently). As nice as it sounds on first sight it actually has a lot problems @JakSparro98. For example, how should tile health be handled? If you connect barrels, crates and solid tiles, what happens when someone shoots it? Things aren't as simple after all. I don't know much how Box2D works but I found something that explains two ways of welding objects together, one is with weld joints but the page itself also says that this first method will have a problem, the one we have already experimented (weld joints are not perfectly rigid), the other seems to be a single body solution, here is the source. Title: The almighty annoying person. Why am I blue and underlined? More foreground variations of normal solid/background tiles? Please? Papa Communism #5908 on discord, texture artist and mod creator. Member of (Mask), (Mask) Moodic ingame name. SFD's map editor, as of now, lacks many decorative tiles that deviate from SFD's dark and bleak art style, what I mean is that you can't really replicate, let's say, sonic with SFD's colour palette, it would just be plain impossible. And of course, this doesn't need to be possible but I think there should be an option for players to be able to sink in tons of hard work to completely change their level's aesthetics to match another game or just to give their own level a completely unique aesthetic. So, I present to you... The pixel, which would exist in all three categories of tiles, solid, foreground, background, and far background, so what is it? A literal pixel, which can be moulded into whatever you want and won't just use SFD's limited colour palette, instead, it'll use RGB colour values to determine it's colour. 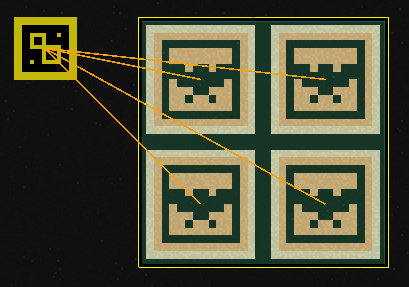 To be easier to "mould", the edges of the pixel would be able to expand by dragging the edge like any other tile currently in the editor, this would make the process of making a tile less monotonous, like having to copy-paste it again and again just to make a damn line. 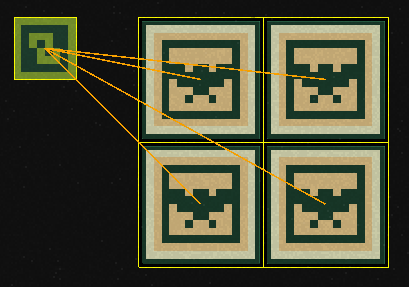 and for a more complex suggestion... after the tile is done, it can be put into a "tile group" which'll function like a normal group but it'll be able to expand and shrink like tiles. Okay, let's say it's not possible, I've been making backgrounds pixel-by-pixel with the BgDamage00A tile, and I hate that I have to copy-paste again and again just to make a damn line and I hate the fact that the colour of the tile can't get any lighter even though lighter colours exist in SFD's palette. If the devs wanna go the minimalist route the least I want them to do is make a new "pixel" tile that has all the colours in SFD's palette and exists in the categories FG, Solid, BG and FBG. Another good thing with the pixel tile is that, if you are just feelin' nostalgic but have no intention on making an entire level of mario world, because you just aren't talented enough to pull it off accurately, or you don't have the time, you can just make some of the tiles used in mario and upload it to the cloud and hope to inspire someone who's more talented, or has less of a life than you, to make a mario world themselves. And this also solves all the tile suggestions, if you want a tile in foreground you can replicate the tile with the pixel, tile group it, and then post it on sfdmaps or something for fellow mapmakers to use. Bot Control Markers for upcoming new CPUs. I know that there is still a bit of time before SFD will be released on steam with CPU AI, yet I think that developers haven't thought about adding such feature for your maps and even if, I would like to share how i would like to see this. Target player: Select CPU you want to be controlled. Target path: The start of CPU's path. Select first BotControlPath marker. Loop: If you want CPU to endlessly move by moving to first BotControlPath after finishing whole path. False / True. Activate on Startup: If you want CPU to move by path in startup. Otherwise you have to activate this marker with BotControlValueTrigger. True / False. Enable Actions: If you want CPU to perform actions from BotControlAction. True / False. (Additional) Track Type: The way CPU moves into BotControlPath markers. Shortest / Random. Random will make bot travel into BotControlPath in a random path. This means CPU will decide whether to move eg. through floating platforms or going under tunnel to reach path marker. BotControlPath - Marker working as movement path for your CPU. After you place this marker on map, CPU will automatically move to location of this marker in shortest way (or random way). Object Type: Static or Dynamic. Yes, this can be dynamic. Target Path: Next BotControlPath CPU will move into after reaching this one. Delay: Time in miliseconds CPU will wait before moving into next path. Activate Triggers: Which triggers will be activated after CPU will reach this path. Stay: False / True. If CPU should stay in this path until BotControlValueTrigger will order to move further (skip option). Can be used in situation eg. you welded player with BotControlPath so CPU chases it. BotControlAction - Marker working as spot where CPU will do something when touching it in it's path. Object Type: Static or Dynamic. This can also be dynamic! Action: What CPU should do. Jump / Roll / Sprint / No Sprint / Walk / Grab Ledge and Release / Grab Ledge and Jump / Punch / Kick / Block / Select Slot 1-5 / Grab / Grab Corpse / Fall (CPU collapses, when used on ledges then CPU will fall) / etc. Action Time: Time in miliseconds of how long CPU will perform certain actions. BotControlValueTrigger - Trigger which allows you to modificate some values and CPU controlling in general. You can change BotControl options and one option made for BotControlPath (skip). Target: Which BotControl's values you want to modify. Skip: False / True. If set to true, CPU will skip current target BotControlPath and move to next one. Mostly used for stopping CPU from moving into BotControlPath markers with stay option as true. It's countless how you could use those markers in your maps, in simple or creative ways. Developers, please think once or twice about adding this, in my opinion it will make SFD steam release even more spectacular. Re: Bot Control Markers for upcoming new CPUs. This sounds great for map creators. I am not that experienced with map making however this can be very useful for cutscenes even, similar to how in the beta there is a particular cutscene where the bot performs a punching action. This can be more easily achieve with more nodes like this. Or it could just be an extension of the PlayerCommand trigger. Last edited by Choose_NameHere on Sun Nov 04, 2018 7:48 pm, edited 5 times in total. Here. Just upload the image to Imgur. Hello, i would like to suggest some new tiles in Map editor. -You can slide on the ice.